*Update: To our dismay, Spitzer's removed the Hickory Short Rib Burger from their menu in 2011. What if we were to tell you that you could enjoy a burger unlike many we at Burger Bedlam have tried before? And what if we were to tell you that you could do so while simultaneously gulping down one of 40 world class beers on draft? And what if we were to tell you that you could enjoy such a burger in one of the most happening neighborhoods in Manhattan? And what if we were to tell you that that burger just happens to be one of the best burgers in NYC? Does that sound like something you might be interested in? We thought so. 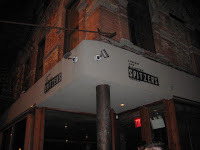 Spitzer’s Corner down on Ludlow and Rivington in the Lower East Side fits the description of such a place. Now, please excuse our blatant Entourage dialogue rip-off (care of legendary Martin Landau), but how else could we sell you? Ok, maybe we could’ve gone the Glengarry Glen Ross route, because burgers are for closers. Yet, we’re pretty sure you catch our drift when we say Spitzer’s Corner might be worthy of some selling…and we think you’re gonna be buyers after this review. Our Expectations: The Hickory Short Rib Burger. A generous eight ounce short rib patty, hickory sauce, BBQ onions and a Guss' Pickle. Add some cheddar and bacon to taste and we're golden. We have some incredibly high expectations at this Lower East Side "gastropub," directly stemming from the amount of praise we've heard from our readers. Granted we had been there once before, we failed to try the burger...chalk it up to too many beers. A buzz can turn your flavor palette bias and how could we honestly eat a burger after three to four quality brews? That's not just, partiuculary when we're on a mission to soberly choose the best NYC burger. Meat: Our first experience with a Short Rib burger, but definitely not to be our last. We foresee many pleasant experiences in our future chowing down on some short rib. Extreme taste, which correlates to the fact that this type of meat often produces heavy marbling. It comes as no surprise that Spitzer's burger hit us with such powerful flavor. Couple that with the fantastic consistency of the meat along with what we consider some of the best special sauce we've tasted on a burger. Toppings: Continuing where we left off above, the hickory sauce: magnificent. A sweet yet savory flavor that we embrace as possibly the best of any toppings sauce we've had on an NYC burger. If that doesn't whet your appetite, how about the BBQ onions? Great execution, providing another added kick which provides the burger with even more flavor. The bacon is crisp and thick and the cheddar was melted perfectly. Its hard to screw up melted cheese, but you'd be surprised at how many burger establishments have failed to conquer the task. Its not to be overlooked. Bun: Soft and slightly toasted (not noticeably though), the bun was good, but not perfect. Unfortunately, it swallowed the burger, as its ratio to created a bun to burger overload. We'd rather not bite into a burger and chew off more bread than burger. Sure we're being somewhat picky here, but we're entitled. You've got to do everything right to earn the top spot in our rankings and consistency is key. Meat (46): Amazingly flavorful, with tender juiciness. The marbling factor in the short rib provides a great bite, every time. Toppings (23): The hickory sauce is fantastic and brings together everything on the burger. If a topping were ever to be known to amplify the meat and flavor, consider this sauce a perfect example. The onions, cheese and bacon are delicious and top notch, but are beaten hands down by the sauce. Bun (21): Soft, but not quite toasted enough. The burger to bread ratio is heavily weighted towards the bread, and that's not a good thing. We like more meat and less bun.